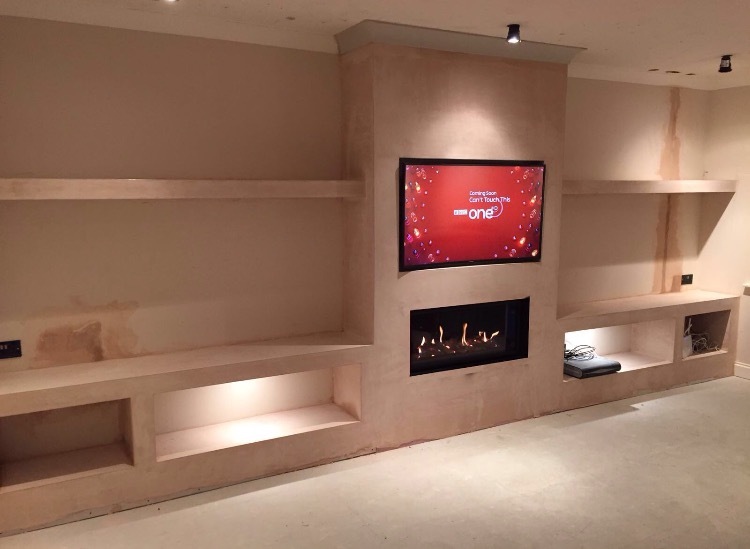 This particular installation features a Studio Polished Travertine Tamariz suite and a Gazco 500 edge balanced flue gas fire. 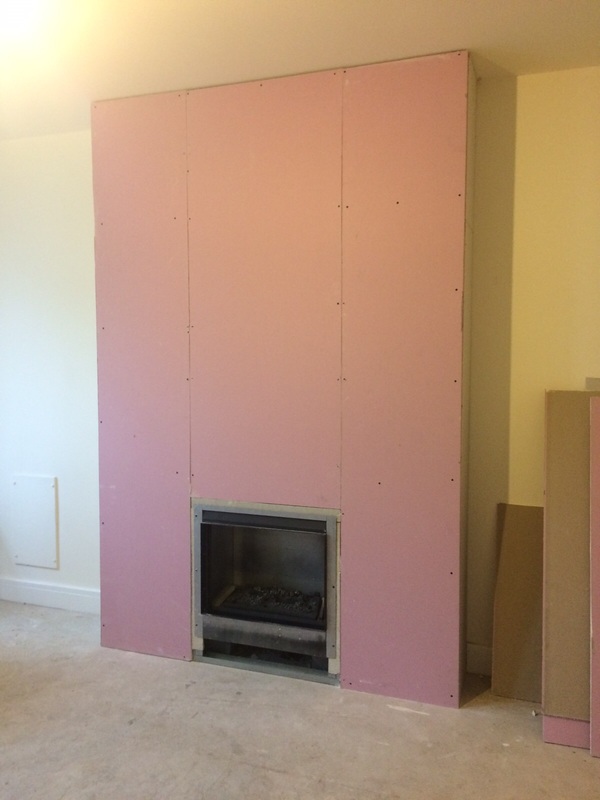 The fireplace installation started with a flat wall. 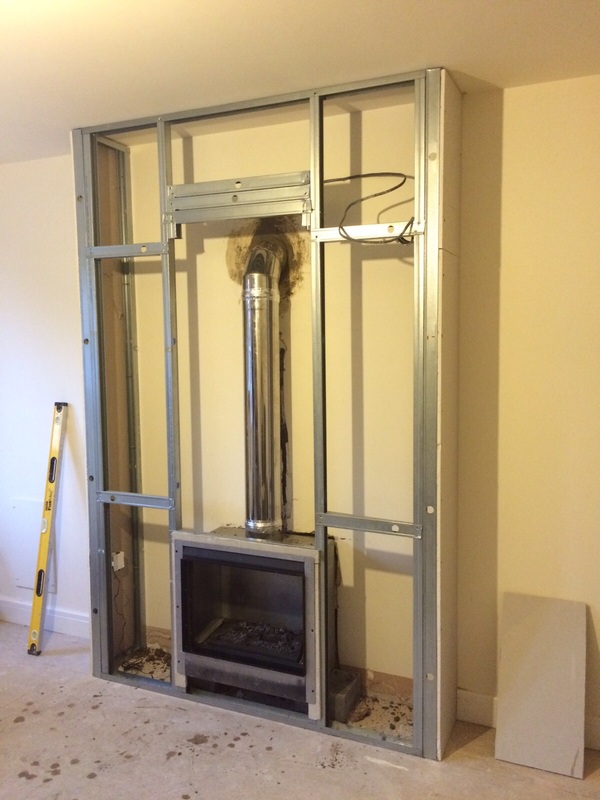 We used the external wall to flue the gas fire as shown in image 1. 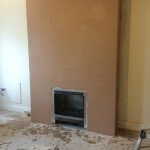 Dominic the engineer began to construct of the track and stud for the false chimney breast, once this was done the plaster board was applied. 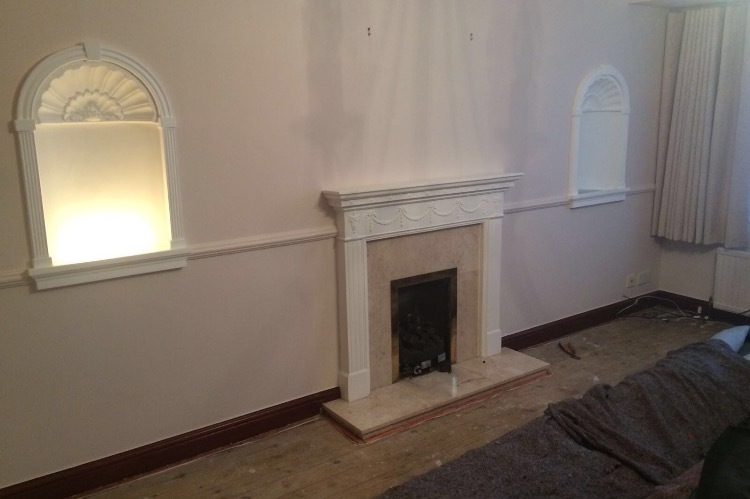 Image 3 shows a plastered finish done by the same engineer, within the same day. Once the plaster had dried Dominic began the construction of the fireplace. 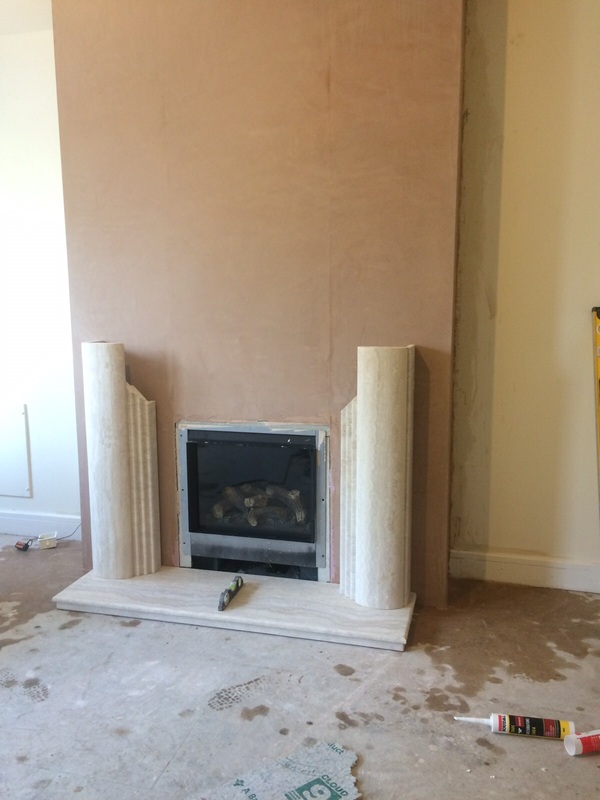 Following the completion of the fireplace construction, the engineer waited for the suite to set before cleaning the surround down and issuing the gas certificates. 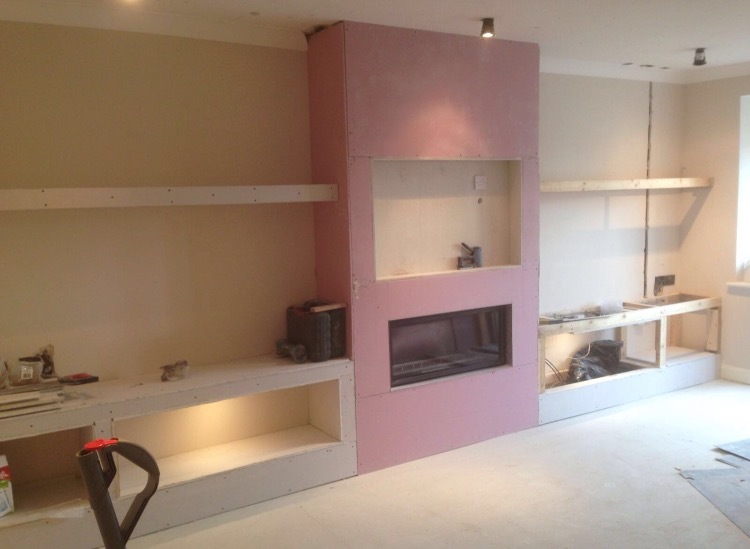 This stunning contemporary false chimney breast and floating shelf design was created by our in house designer Joseph. Looking at the customers room space, and listening to their requirements, Joe began the design and sketched out their new feature. 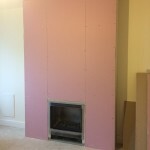 The room began with a flat wall. Matthew the engineer centralized the Gazco Studio 2 Balanced flue gas fire and applied the balanced flue system to the unit. 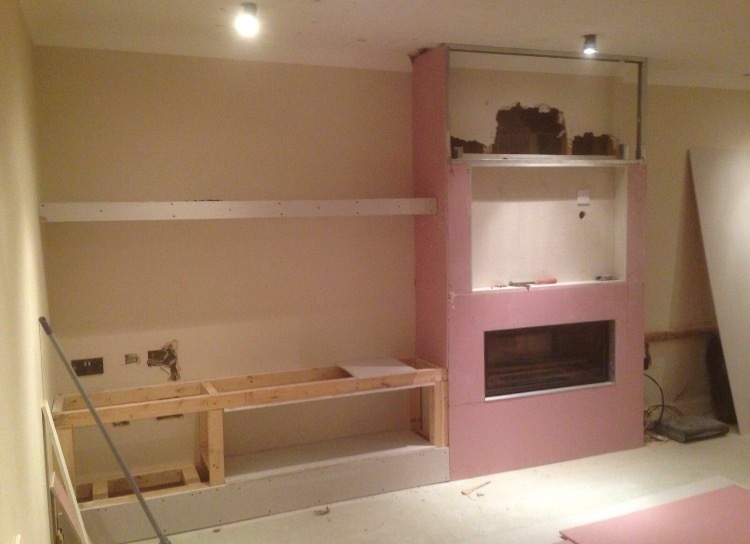 Once the fire had been centered Matthew began to construct the false chimney breast and shelving. 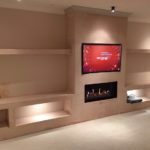 He installed LED spot lights and built a Television recess within the false chimney breast design. 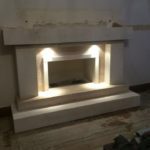 Once the frame had been complete he began to board and plaster; after waiting for the plaster to dry, he commissioned the gas fire and left the customer with a stunning look that would give a ‘WOW’ factor to any living space. 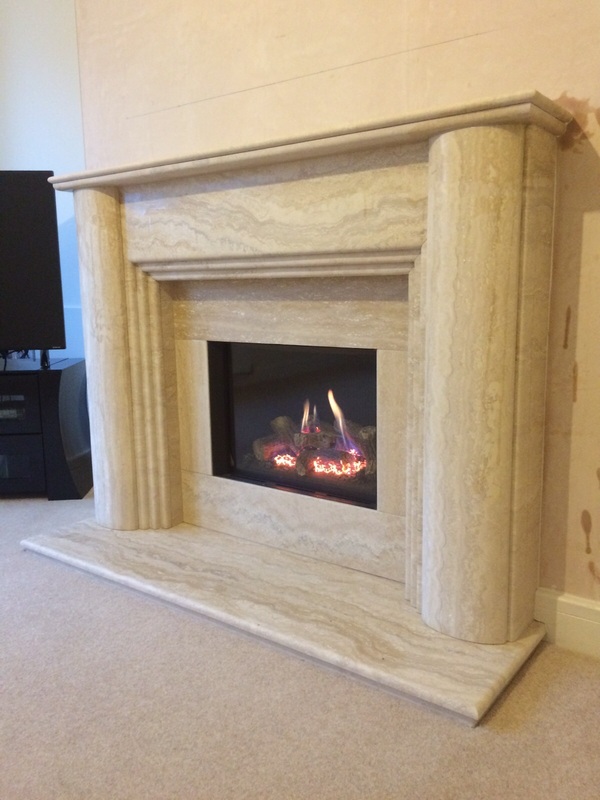 One of the Fireplace Studio’s own exclusive designs, the Studio Madrid suite features a subtle variation between Semi-Rijo Limestone and polished Travertine. 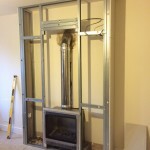 This contemporary suite was installed for Mr & Mrs Harrison from Mirfield. 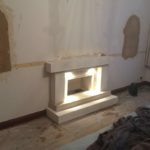 They wanted to install a statement in their living area and that is exactly what the Madrid offers. 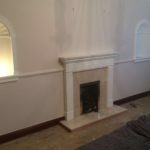 This installation started with the removal of their existing wooden surround and marble set. 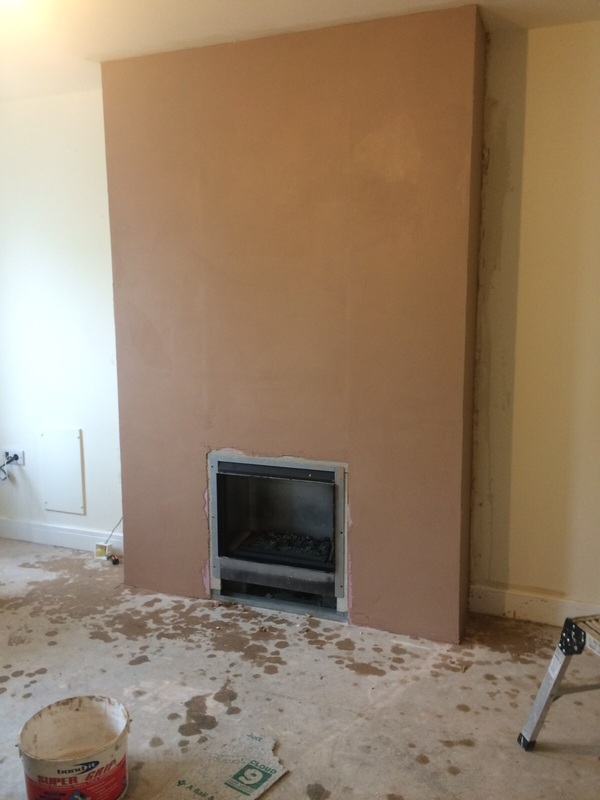 Dominic began the knock out of the external chimney breast to accommodate the chamber of the fireplace. 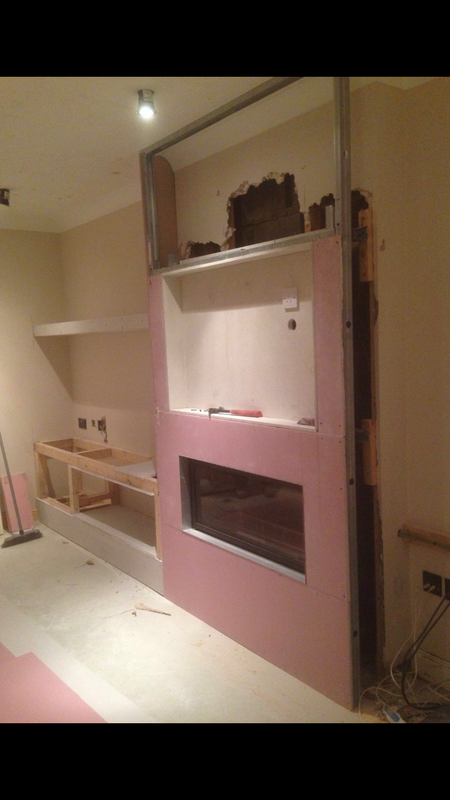 He plastered where necessary and then began to assemble the suite. 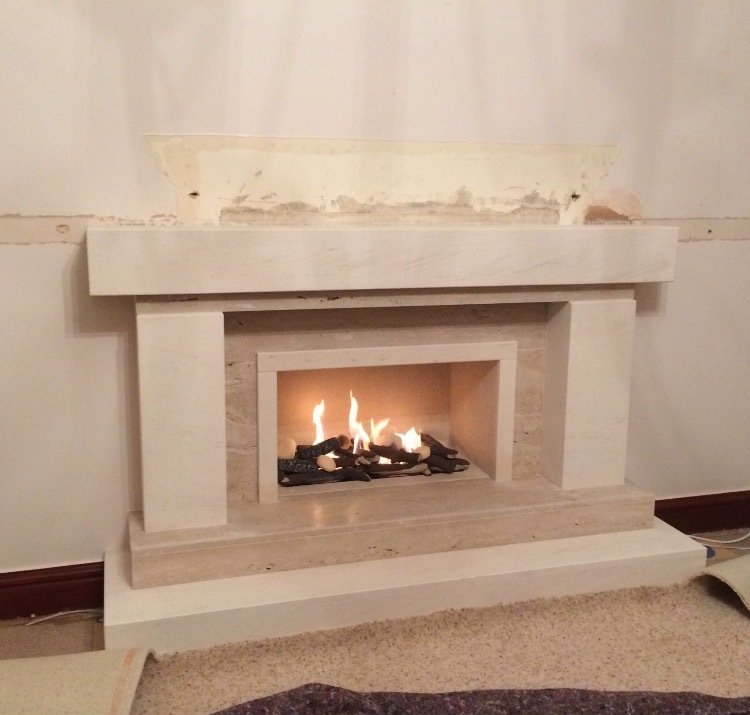 Once the fireplace was in position he started with the gas work for the remote control gas burner. The finished product is shown in image 4. Mr & Mrs Harrison were delighted! 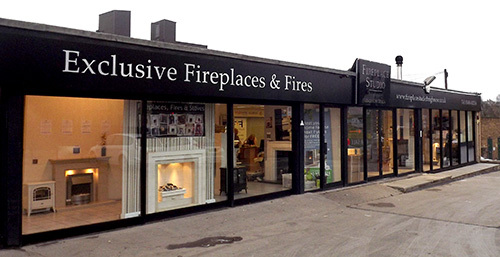 “Many thanks to you all at the fireplace Studio. 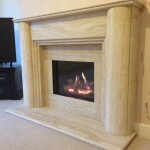 From purchasing the fireplace and having it designed the whole process has been fab! The fitter did a great job too! 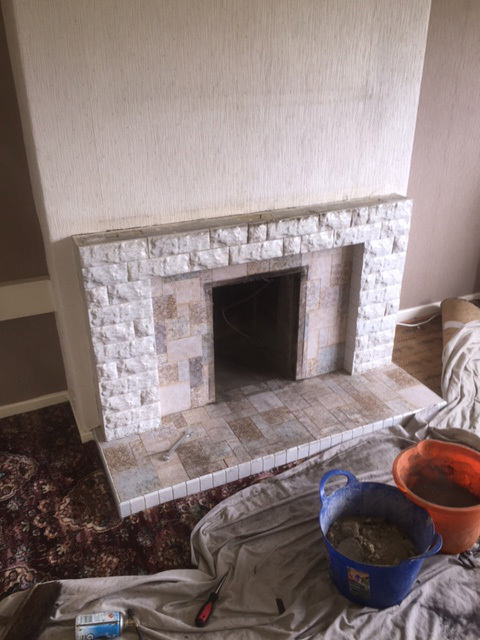 Fireplace Installation – This dated 1970’s stone fireplace was in need of a revamp. 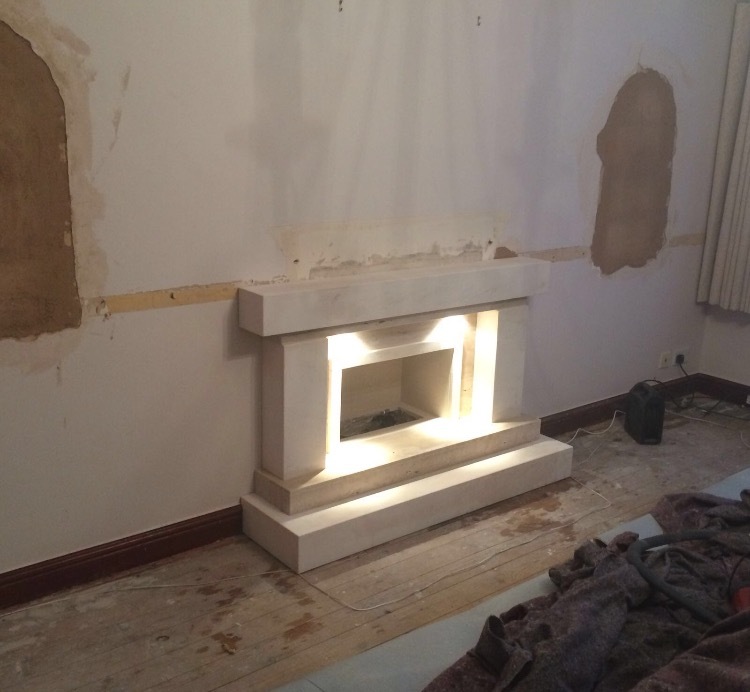 We were delighted to help to ensure Mr and Mrs Jagger got their dream fireplace installation. 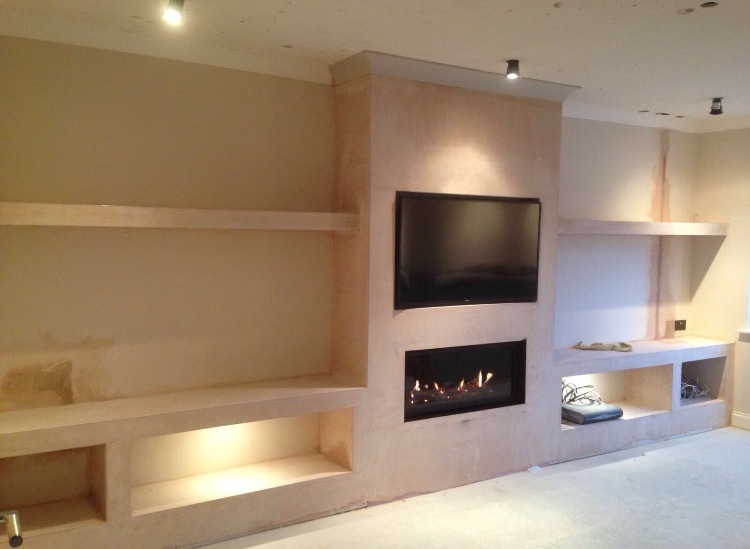 They wanted a fireplace installation that fitted in with the design of their existing living room. 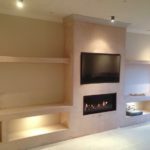 The Fireplace Studios team achieved this and help design and install a fireplace that does the room justice. It’s a perfect balance between complementing the existing look with adding a contemporary look at the same time. 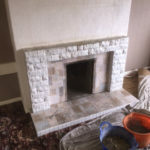 The fireplace installation started with removing all the stone slips on the fireplace back and hearth. 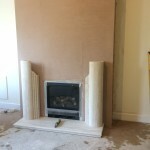 As with every fire we do, the sizes of the opening of the existing fireplace was surveyed (using our free fire installation survey service) to guarantee a perfect fit. 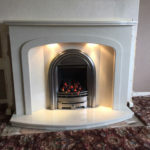 The fire Mr and Mrs Jagger chose was a standard 16 by 22-inch gas fire. Next, we plastered the whole area to ensure a perfectly smooth finish. 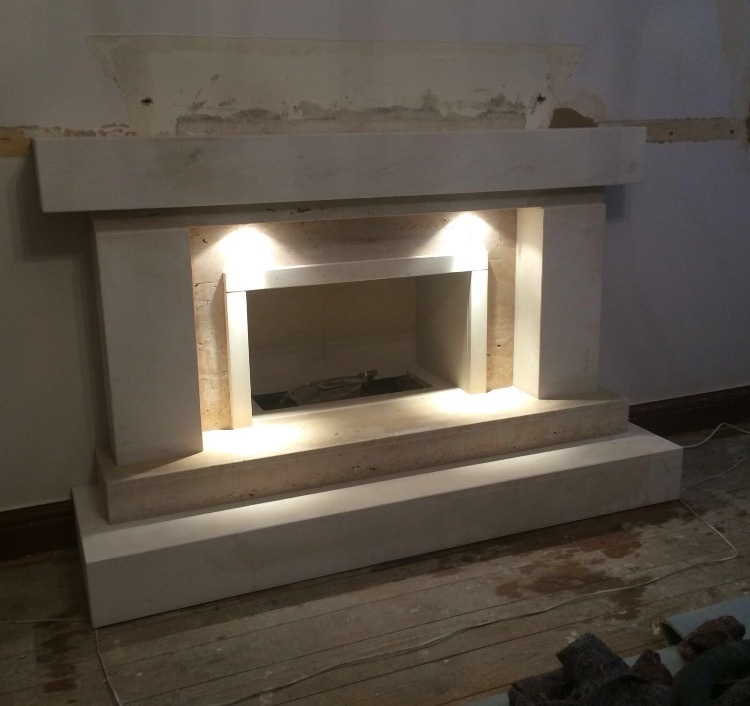 Then begun the fireplace installation, we started with the hearth ensuring it was secure. 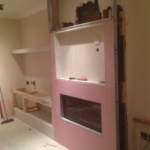 Then we attached the back panel and sides of the fireplace. 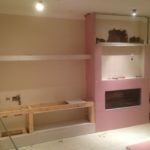 Only when everything is secure, did we attach the shelf to the fireplace using heavy duty brackets. 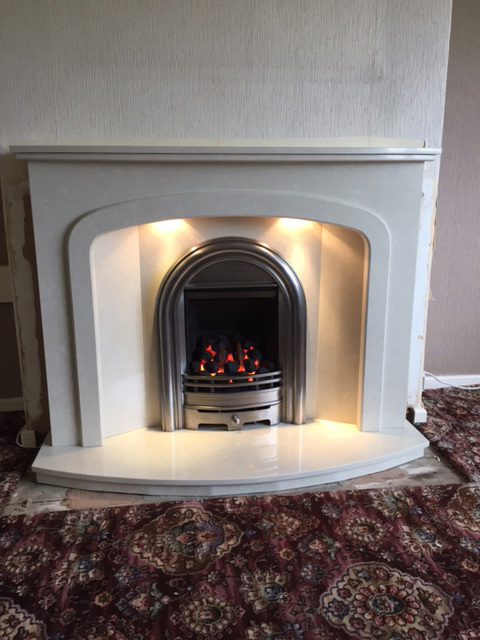 Finally, we installed the gas fire into the existing opening and run our tests so we can issue the gas certificate and relevant paperwork. Mr and Mrs Jagger could then enjoy their beautiful new fireplace.